As a solutions company for health care professionals, managing inventory levels is a top priority. 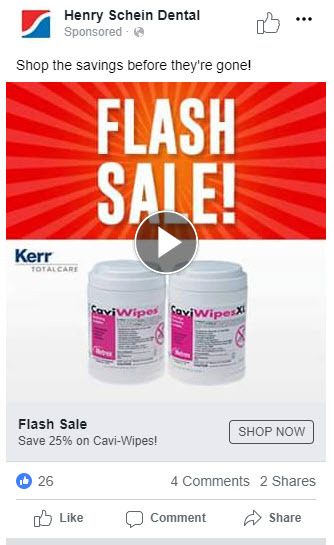 We developed an integrated digitally-led campaign with the specific purpose of moving an overstocked product, CaviWipes, a surface disinfectant. 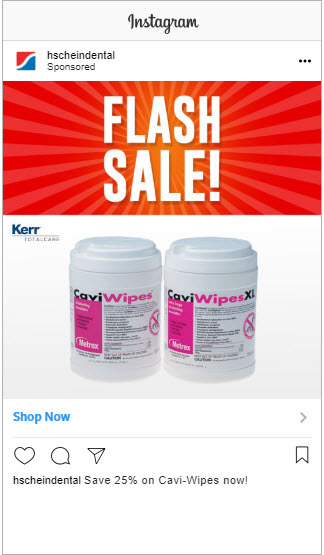 With support from our supplier partner, KaVo Kerr, we created a compelling “flash sale” promotional offer of a 25% discount from our catalog price, available for 5 days only. We marketed the offer through multiple internal and external channels with a consistent creative execution and message. We reached our target audience on our owned properties through a newly created splash page which displayed once a day to all visitors to our site, web banner ads in multiple placements across our site and we boosted the product in our product recommendation engine to appear as the first recommended product in relevant categories. In paid channels, we reached our audience through Facebook and Instagram and launched a paid search campaign to capture customer and non-customer traffic. We also leveraged traditional marketing channels such as email to our customers and package enclosures within shipments. All of these marketing assets drove customers to a landing page within our site which reinforced the offer where the product could be purchased. This flash sale drove a 17% lift in sales and a return on investment of 933% and more importantly, proved that digital can be not only a transactional support channel for ordering, but a stand-alone sales channel. The results of this campaign have been shared across the company with plans to replicate in other parts of the business.